The following has come in from Joss Lynam. at about 8 pm. (weather permitting). Donations of all sizes will be very welcome. Joss is an old friend who has done a lot for mountaineering in this country and who is fighting a battle against cancer himself. The mountain list that MountainViews uses has in part come from a list he developed many years ago. While rather often he and I agree to differ particularly on aspects of hillwalking I have no hesitation in recommending that people contribute to this cause. 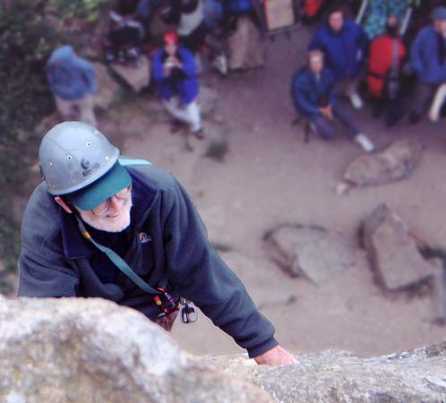 Photo was from 2004 when Joss was celebrating his 80th birthday in Dalkey Quarry.